Benny "Bugsy" Siegel (Warren Beatty) is a mobster working for Meyer Lansky (Ben Kingsley) and Charlie "Lucky" Luciano (Bill Graham). He was sent to Los Angeles on what was supposed to be a 12 day round-trip to convince the local crime boss to join the Luciano family. Benny gets caught up in the Hollywood lifestyle with his actor friend George Raft (Joe Mantegna) and falls for film extra Virginia Hill (Annette Bening). While on a trip to a gambling hall in Nevada, he gets the idea of building a grand hotel in Las Vegas called The Flamingo. This would be a resort where the wealthy, the famous, and the common man can come to gamble, relax, and spend all their money, and better yet, it would all be legitimate. 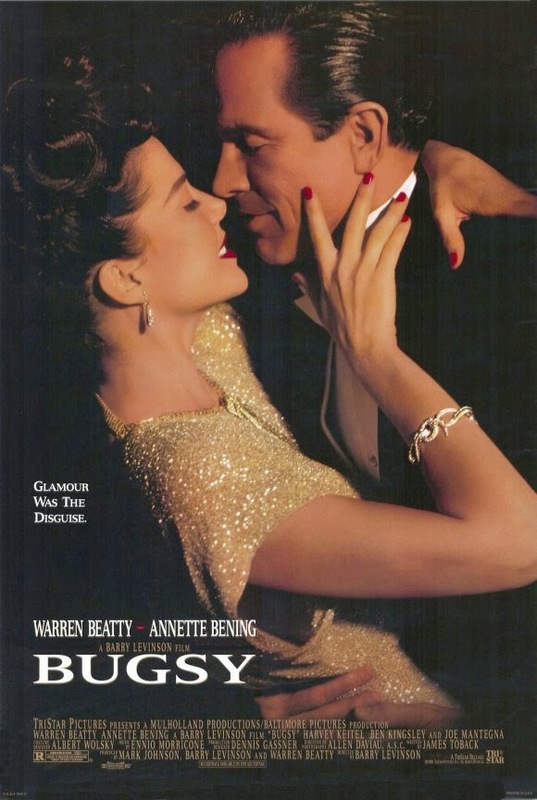 "Bugsy" is a good enough movie, but it is certainly not without its flaws. It does a good job capturing the lighter part of Benny Siegel's personality, but it misses the mark with his darker side. It delves into the man himself, not so much his actions as a mob boss. Siegel certainly had a penchant for the more extravagant things in life. He had a desire to work in film and hung out with many Hollywood celebrities. He was a flashy individual who was also very focused on his looks and was very charming and well liked, but none of this a gangster movie makes. Warren Beatty is able to capture that aspect of Bugsy's life rather well and he also does a good job at not shying away from the madness, the power and the absurdity that money and status bring people. On the other side, Siegel was a ruthless killer and was also a highly feared individual with a strong propensity for violence. This aspect, though on display as he kills people in the film, isn't really captured well. We never fully believe Beatty as a hit man and someone to be feared. Also, Beatty often comes off not so much as charming, but borderline silly or eccentric at times. An actor who pulls off this dual personality of the charming fun guy and violent murderous hit man really well in other films is Joe Pesci (though he couldn't have played Siegel). Pesci flips a switch like no other. Beatty is never really able to put that "don't mess with me" fear into you. The film's main focus seems to be on the relationship between Siegel and Virginia Hill, played by Annette Bening. Though this is the movie's central plot, it is probably one of the least interesting things about him. Annette Bening does a good enough job with what she is given with such a one-dimensional character, but unfortunately, Virginia Hill lacks any sort of real depth and serves only as a muse and foil for Siegel. There is no other reason for her in this film apart from the fact that she is a woman and is used as a plot device. Also, the film certainly takes some historical liberties, painting Bugsy as a visionary who imagined up Las Vegas, which is not entirely true. We won't fault filmmakers for this as it does make him more interesting and adds something more to his character other than just being a thug, at least within the context of the movie. Overall, this is a decent film, but not one of the truly great and more memorable gangster film, though some might disagree.